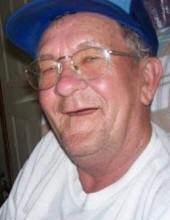 Arnold Luther Alcorn, 69 years old, of Georgetown, went home to be with our Lord on February 2, 2019. Born on January 25, 1950, Arnold was a very loving man that devoted the final years of his life to caring for his ailing wife. Arnold was preceded in death by his parents, Raymond and Cora Cook Alcorn of Georgetown, an infant sister, Blanche Alcorn, brother Charles Marshall Alcorn and sister Carolyn Alcorn Scott, both of Georgetown. Arnold leaves behind his wife, Goldie Land Alcorn, his sons, Wesley (Nicole) Alcorn, of Georgetown, and Shannon (Jenny) Alcorn of Cynthiana, two granddaughters, Laci and Hannah Alcorn of Cynthiana, a brother Johnny Alcorn of Georgetown, two sisters, Janice Canafax, Blanche Canafax of Paris and many cousins, nieces and nephews. Arnold was an active member of the United States Army in the 1970s. After leaving the Army, Arnold began working in construction until he retired in 2005. He was a member of Royal Springs Baptist Church and enjoyed the home visits that the church provided him and his family, while they were unable to attend due to their health issues. Visitation will be at Tucker, Yocum & Wilson Funeral Home on Tuesday, February 5, 2019 from 5 to 8. Funeral services will be 12:30 pm, Wednesday, at the funeral home with Brother Shellie Tackett, Assistant Pastor at Royal Springs Baptist, officiating. Burial will follow the service at Camp Nelson National Cemetery in Nicholasville, Kentucky, with Military Honors. Pall bearers will be Jerry Alcorn, Owen Alcorn, Michael Canafax, Danny Canafax, Chris Alcorn, Brian Alcorn, Robert Lewis Jr. and Jason Land. Online condolences maybe made to the family at www.tuckeryocumwilson.com. To send flowers or a remembrance gift to the family of Arnold Luther Alcorn, please visit our Tribute Store. "Email Address" would like to share the life celebration of Arnold Luther Alcorn. Click on the "link" to go to share a favorite memory or leave a condolence message for the family.